92% believe that success should be measured by more than profit alone. 80% prefer on-the-spot recognition over formal reviews. 61% feel personally responsible to make a difference in the world. 50% want to start their own business, or have already done so. Shuang Hor Business ticks all the boxes. 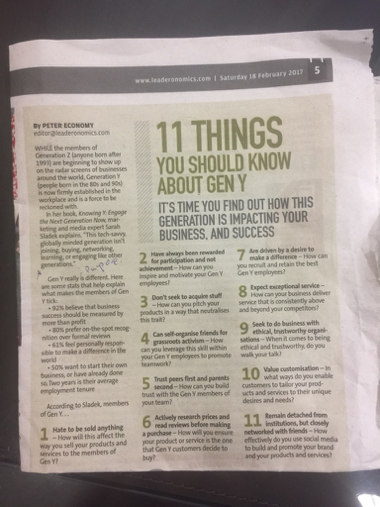 How do we convey this message to Gen Y? 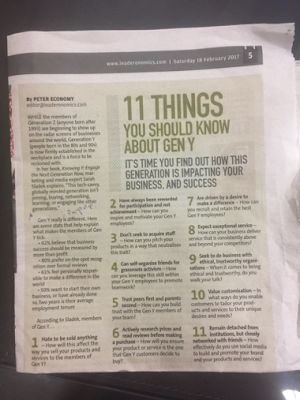 In her book, Knowing Y: Engage the Next Generation Now, marketing and media expert Sarah Sladek shares her view on Gen Y and their 11 key characteristics. Now let me show you how Shuang Hor Business fits right in.. Medications and drugs do not prevent diseases. We go to doctors only after we fall sick. Some of the drugs big pharmaceutical companies sell destroy our health more than save it. However, with Shuang Hor, you have the opportunity to help people take care of their health before it's too late. You contribute to their well-being. You help make a change to humanity when you empower people with the knowledge on how to take care of their family and friends' health. Shuang How Business adopts the "Pay It Forward" model - you help people who are trapped in the rat race after you get out of the rat race. When they see how their lives can be transformed by this business, they will choose your solution. Shuang Hor is a unique business that focuses on teaching us how to be good people, and at the same time learning how to conduct the business. You, together with your team, just need to sincerely share what you learn. You will touch many people's hearts. 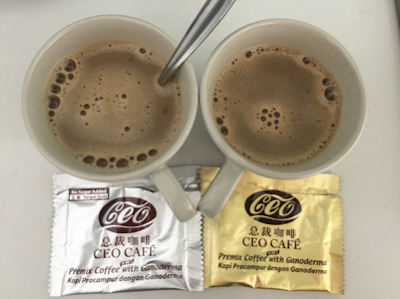 Even though you can earn a lot of money from Shuang Hor, this business gives you much more than just monetary gains. Shuang Hor offers everyone 8 Treasures, which is a complete bundle comprising Time freedom, good Health, Respect & Recognition, closeness with Family, strong bond with Friends, doing Charity, leaving a Legacy and of course Money. Leverage on the multiple meetings organised by Shuang Hor for your own growth and development. After that, pull together your friends to join you in these meetings so they can also learn and share your values. Together all of you become part of the process of change to make this world a better place. Shuang Hor emphasizes teamwork and the power of attracting people into the business. There are many Gen Y in this region who have made it in Shuang Hor. Find out from them why did they venture in and how can this business give you what you want. Shuang Hor has been around for 30 years. It is the world leader for its star product Lingzhi, which is safe, effective and does not cause side effects. For the R&D it has invested, it offers good value for the price. All these are facts which can be easily verified. When you are part of Shuang Hor, you are in a position to influence and make positive changes to your family's lifestyle and diet. You derive satisfaction from being involved in making a difference to your peers, be it to their mental, emotional or physical well being. When you service your consumers and friends, you strive to consistently deliver service that is above and beyond your competitors. Care for them as if they are your best buddy or your family member. Come to more meetings organised by Shuang Hor. Come to connect with the leaders who have been in this business full-time for 15 years and more. You will know that Shuang Hor is a very ethical company. It pays all remunerations on time. It uses topgrade ingredients for its products. It practices honesty in its dealings with other parties. It constantly reminds its distributors to do the business with integrity and practice good moral values. Shuang Hor's products and solutions are tailor-made to the unique desires of each individual. We take the time to identify your needs before we propose a suitable solution that is personalised to you. Word of mouth is the core of Shuang Hor Business. Try the products for yourself. Then honestly share how you have benefited from them. The social media can easily attest to the authenticity of your words. The more down to earth is your business the more appealing it is to the Gen Y. From the above, you can see that Shuang Hor fits like a glove to the 11 key characteristics of the Gen Y. Want to find out how to be a part of Shuang Hor? Email me at askfuiping@gmail.com. Let's work together to achieve your success.